Bob, 41, who has been a paramedic for 13 years, said: “I was reflecting on some of the calls I’ve attended at the roadside where I had to look through the mobile phone contacts struggling for information on a shocked or injured person. “It’s difficult to know who to call. Someone might have “mum” in their phone book but that doesn’t mean they’d want them contacted in an emergency. The campaign was launched this week by Bob and Falklands war hero Simon Weston in association with Vodafone’s annual Life Savers Awards. Vodafone spokesperson Ally Stevens said: “The Life Savers Awards already demonstrate, through practical example, the important role a mobile phone can play when minutes matter in an emergency. 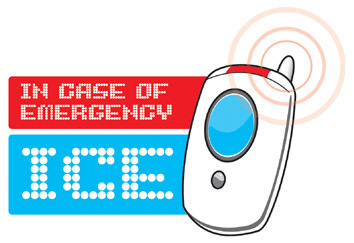 The campaign is also asking people to think carefully about who will be their ICE partner – with helpful advice on who to choose – particularly if that person has to give consent for emergency medical treatment. Bob hopes that all emergency services will promote ICE in their area as part of a national awareness campaign to highlight the importance of carrying next of kin details at all times. He said the idea was for the benefit of loved ones as well as the patient. “Research suggests people recover quicker from the psychological effects of their loved one being hurt if they are involved at an earlier stage and they can reach them quickly,” he added. This seems an excellent idea (despite some possible flaws – how do I know how to work someone else’s phone? ), and I’d encourage you to support it, stick a number in your mobile, and pass on the information… And thank you, of course, to the reader who passed this on to me. For more information on the campaign, see the ICE website. On another mobile note, you can now access this very site via your WAP-enabled mobile. Just point your WAP browser to sjhoward.co.uk/mobile, or text ‘sjh’ to 60300 to have the link sent to your phone (texts cost 25p). As always, full details are in the Site Guide. This 671st post was filed under: Technology. Comment posted at 15:12 on 12th July 2005. The Guardian’s Online has picked up on this now, via the Press Association. It was also apparently featured on this morning’s Today programme – I didn’t hear it though, so I must have slept through that bit.